Reinforcements – The 60th Battalion C.E.F. 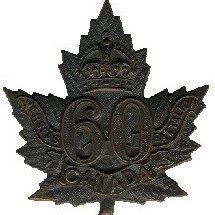 "Victoria Rifles of Canada"
During its existence the 60th Battalion was reinforced by one thousand three hundred and eighty three men who enlisted with other battalions or regiments. The reinforcements came from across Canada.